This best practice guideline focuses on assisting nurses working in diverse practice settings in the assessment and/or screening of stroke survivors. The goal of this document is to provide nurses with evidence-based recommendations regarding the assessment and/or screening of stroke survivors across the continuum of care. Nurses working in partnership with the interdisciplinary health-care team, stroke survivors and their families, have an important role in assessment and/or screening across the continuum of care. It is acknowledged that from a comprehensive client assessment, planning, interventions and evaluation of care follow. 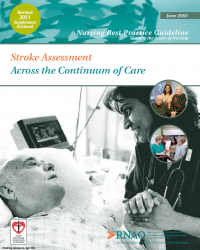 The scope of this document addresses the first phase of the nursing process, assessment, and does not incorporate recommendations related to stroke management interventions. This guideline focuses on adults (over age 18) who have experienced a stroke. It is recognized that the experience of stroke impacts on the entire family, and nurses have a role to play in the assessment of the family and family caregivers. However, the focus of this document is on the screening and/or assessment of the adult stroke survivor. This is not meant to exclude the pediatric client, but children have unique assessment needs related to developmental stages that are beyond the scope of this guideline. For the purpose of this guideline, types of stroke include transient ischemic attacks (TIAs), ischemic and hemorrhagic stroke. This guideline contains recommendations for Registered Nurses and Registered Practical Nurses on best nursing practices in the area of stroke assessment. It is intended for all nurses (who are not experts in stroke care), who work with stroke survivors in a variety of practice settings across the continuum of care. However, it is not meant to exclude those who have expertise in this area. 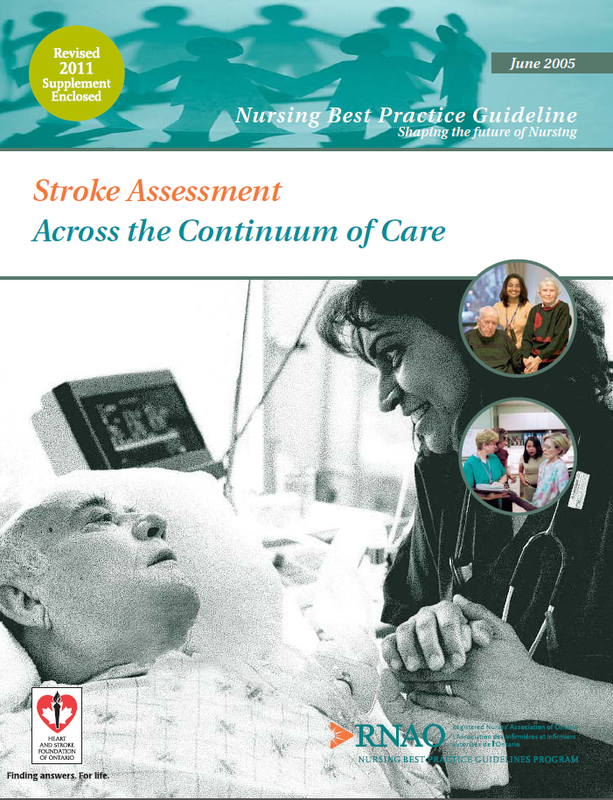 Nurses have knowledge of client assessment principles, and the focus of this guideline is to emphasize a holistic, focused stroke assessment. This guideline was developed in partnership with the Heart and Stroke Foundation of Ontario.